The essential guide for forward-thinking business leaders who see the Green Wave coming and want to profit from it. This book explores what every executive must know to manage the environmental challenges facing society and business. 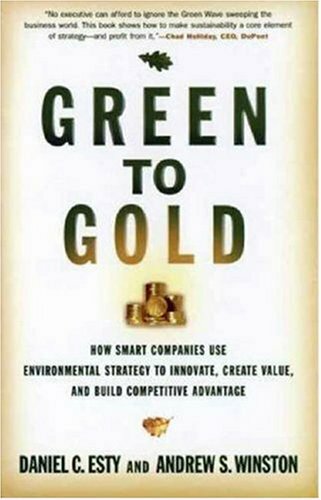 Based on the authors' years of experience and hundreds of interviews with corporate leaders around the world, Green to Gold shows how companies generate lasting value, cutting costs, reducing risk, increasing revenues, and creating strong brands, by building environmental thinking into their business strategies. Daniel C. Esty and Andrew S. Winston provide clear how-to advice and concrete examples from companies like BP, Toyota, IKEA, GE, and Nike that are achieving both environmental and business success. The authors show how these cutting-edge companies are establishing an "eco-advantage" in the marketplace as traditional elements of competitive differentiation fade in importance. Esty and Winston not only highlight successful strategies but also make plain what does not work by describing why environmental initiatives sometimes fail despite the best intentions. Green to Gold is written for executives at every level and for businesses of all kinds and sizes. Esty and Winston guide leaders through a complex new world of resource shortfalls, regulatory restrictions, and growing pressure from customers and other stakeholders to strive for sustainability. With a sharp focus on execution, Esty and Winston offer a thoughtful, pragmatic, and inspiring road map that companies can use to cope with environmental pressures and responsibilities while sparking innovation that will drive long-term growth. Green to Gold is the new template for global CEOs who want to be good stewards of the Earth while simultaneously building the bottom line. I have read and praised Natural Capitalism: Creating the Next Industrial Revolution, The Ecology of Commerce and Cradle to Cradle: Remaking the Way We Make Things here at Amazon, and I mention them to emphasize that this book, "Green to Gold," is the hands-down no-contest best primer for top management. The others are intellectual presentations. This is a business oriented primer with lots of facts, lists, and resources. It is a pro-business book that focuses on opportunities. It is extremely well-organized, with three parts, twelve chapters, and three appendices including a superb list of active web sites relevant to doing well by doing good. This book is based on hundreds of interviews over four years, and every aspect of it is professional presented, including boxes with "10 second overviews" interspersed throughout. The authors are compellingly pointed in their discussion of how the environment, and attendant regulations and attendant risks of catastrophic costs, is no longer a fringe issue. Mistakes in cadmium content of connecting cables can cost hundreds of millions. The authors excel at discussing the new pressures from natural limits that are now visible (changes that used to take 10,000 years now take 3--see my reviews on Ecological Economics, the Republican War on Science, the varied books on Climate Change, etc) and the fact that there is a growing range of stake-holders who are altering the balance of power. The authors are clear in noting that environmental compliance and wisdom is neither easy nor cheap, but they are equally detailed in documenting that most investments to reduce environmental costs are recouped within 12-18 months. In one cited example, 3M saves $1 billion in the first year alone on pollution reduction, and over the course of a decade, was able to reduce its pollution by 90%. The authors do a superb job in summarizing each of these in several pages perfectly suited to the busy manager. For those desiring more in-depth looks, see my many reviews across the board, including Priority One: Together We Can Beat Global Warming; various books on energy, Water: The Fate of Our Most Precious Resource; Pandora's Poison: Chlorine, Health, and a New Environmental Strategy, Blue Frontier: Dispatches from America's Ocean Wilderness; and The Blue Death: Disease, Disaster, and the Water We Drink. The bottom line for the first part of the book: extremes can no longer be dampened down; and we now recognize the eco-system value of the wetlands that we have paid the Army Corps of Engineers to eradicate for decades. The authors devised a schema for businesses to develop an understanding and then a strategy for reducing their environmental footprint. The authors do extremely well with their organized examination of Aspects, Upstream, Downstream, Issues, and Opportunities (AUDIO), and anyone looking at the book in a store can go directly to pages 62-63. This is an operational management handbook. There is an excellent overview of the many new stake-holders (or significantly matured stake-holders including NGOs, religions, and local citizens. Business can no longer bribe government--government cannot "deliver" the way it used to (see my review of The Global Class War: How America's Bipartisan Elite Lost Our Future - and What It Will Take to Win It Back for a sense of how corruption of other elites by our elites has accelerated all the ills of the world). Regulations, according to these authors, should be seen as vital incentives and parameters for both reducing costs and gaining trust. Forty global banks, and many insurance companies, now demand proper examination of ecological costs as a condition for funding or coverage. The authors remind me of General Tony Zinni, whose books I have reviewed, in their emphasis on relationships developed over time. They urge a strong focus on relationships NOW, across the board, as a means of building a "trust bank" as well as a deeper understanding. Blocks that used to be labels "not our problem" or "not legally liable" are now labeled "IMPORTANT TO US." In the middle of the book they explore the digital information advantages that can accrue to those who get out of their closed loops and increase innovation. In one instance, simply adding load to trucks reduced fuel consumption and emissions considerably. The middle of the book contains 8 detailed "Green to Gold" plays, and I won't spoil it by listing them. A box in this section says "Truth Matters" and I applaud silently. The authors stress that mind-set, not just a check-book, is required to get this right. Five basic rules are 1) See the forest; 2) Start at the top; 3) No is not an option; 4) Feelings are facts; and 5) Do the right thing, morality DOES pay. Pages 168-169 are sheer brilliance, and illustrate why the value chain must be completely integrated into the environmental strategy of each element of that value chain and most especially the largest and most powerful of the elements, which must carefully consider and accept responsibility for demanding improvements by the smallest elements. Eight lessons of partnering, 13 problems and their solutions, and a final chapter of very specific actions that managers can take, conclude the book. My final note on this book: a pleasure to read, easy to read, so well done I got through it in half the time characteristic of denser or less well designed books. This is first rate stuff! The item is wonderful!I'm reading ! Excellent breakdown of the drivers for companies to go green. Also excellent analyses of strategies used by the corporate world to achieve their goals with green programs. Many examples of what worked and what didn't work. A required reading to all executives! This book explores what every executive must know to manage the environmental challenges facing society and business. According to the authors, companies generate lasting value by building environmental thinking into their business strategies. This book attempts to show how to be good stewards of the Earth while simultaneously building the bottom line; how to keep a sharp focus on execution while using an environmental strategy; and ways to cope with environmental pressures and responsibilities. According to the authors, the state of the art in environmental thinking can be summed up with the slogan, "Reduce, Reuse, Recycle." The best pollution-control option is to reduce the use of resources and eliminate waste. The next best option is to refurbish or reuse items. Then recycle what's left. As a last resort, throw something out. (a)	In the weeks before Christmas 2001, the Dutch government was blocking Sony's entire European shipment of PlayStation game systems; more than 1.3 million boxes were sitting in a warehouse because a small, but legally unacceptable, amount of the toxic element cadmium was found in the cables of the game controls. Sony rushed in replacements to swap out the tainted wires. It also tried to track down the source of the problem by inspecting more than 6,000 factories and resulted in a new supplier management system. The total cost of this environmental problem was more than $130 million. (b)	In a speech to shareholders, Wal-Mart CEO Lee Scott vowed to cut energy use by 30 percent; to use 100 percent renewable energy (from sources like wind farms and solar panels); and to double the fuel efficiency of its massive shipping fleet. The company will invest $500 million annually in these energy programs. (c)	In the mid-1990s, executives at Unilever saw a big threat to one of their product lines. Supply for the frozen fish sticks business was at risk because the oceans were running out of fish. In partnership with World Wildlife Fund, the company set up the Marine Stewardship Council, an independent body to promote sustainable fisheries around the world. The Council certifies fisheries where the total catch is limited so that fish populations do not diminish over time. To create specific incentives for fishermen to seek certification, Unilever committed to buying 100 percent of its fish from sustainable sources by 2005. (d)	Over the last 15 years, chemical giant DuPont has cut its contribution to global warming by 72 percent. Half of the cuts came from changing one process: the production of adipic acid. This modification eliminated emissions of nitrous oxide, a potent greenhouse gas that causes far more warming than carbon dioxide. (e)	IKEA is proud of its "flat packaging." Efforts to squeeze millimeters out of every box have allowed the company to pack its trucks and trains tighter. That saves up to 15 percent on fuel per item. (f)	Toyota saw the Green Wave coming and responded with the energy-efficient "hybrid" Prius, a breakthrough product that enhanced profits. 1. Climate Change. This includes rising sea levels, changes in rainfall patterns, severe droughts and floods, harsh hurricanes and new pathways for disease. 2. Energy. Companies selling goods and services that promise to improve energy efficiency will claim market share. 3. Water. Companies around the world now face limits on access to water. 4. Biodiversity and Land Use. Biodiversity preserves our food chain and the ecosystem on which all life depends. It also holds prospects of new drugs, foods and other products. A key factor in the decline of biodiversity is habitat loss. 5. Chemicals, Toxics and Heavy Metals. Part of what makes air pollution more dangerous is the presence of toxic elements. Exposure to chemicals like dioxin, a byproduct of production processes such as papermaking, and heavy metals such as lead and mercury can create severe public health risks. 6. Air Pollution. Significant air-quality controls on factories, cars and other emissions sources have reduced air pollution over the past 30 years in the United States, Japan and Europe. But the air is still not clean. about $200 billion to clean up over the next 30 years. Under the liability provisions of the Superfund law, anyone found responsible for the waste at a site can be held liable for the full cost of cleanup, even if the toxics were legally disposed. reduced agricultural productivity, higher risk of skin cancer and other health problems. 9. Oceans and Fisheries. More than 75 percent of the world's fisheries are over-exploited and beyond sustainability. 10. Deforestation. Every company that uses wood, paper or cardboard packaging has a stake in, and responsibility for, the state of our forests. When McDonald's realized 15 years ago that litter was an issue, it began working on reducing packaging. Companies can and should be a force for good, leading the charge on caring for the environment and protecting our shared natural assets. Financial and environmental success can be achieved together. With the right mindset and tools, companies can handle the hard trade-offs. I LOVE Green to Gold. Not because I'm a crunchy-granola type baby boomer (and, yes, I am). Not because I admit to having a personal passion for sustainability, the environmental movement and all things green. Not because I believe in climate change and the threat to our planet. I love Green to Gold because so many of the examples that Daniel Esty and Andrew Winston provide are a study in business strategy. And because they break very complex initiatives into core concepts. And because they graphically illustrate how businesses can do well by doing good. They are truly gifted at being able to both integrate BIG concepts (like how environmental issues are driving market forces) and break down business strategy into manageable steps (e.g. their 14 approaches that build an eco-advantage culture). As they talk about what companies as diverse as 3M, Starbucks, Xerox and Unilever are doing to turn green to gold, they help the reader hone strategic and business acumen. Every executive, and anyone cultivating an executive mindset, would benefit from reading this book and asking her or himself how it applies to her or his business. It's a dense read, but invaluable. What else would you expect from a book that explains "how smart companies use environmental strategy to innovate, create value and build competitive advantage"?